The following is a list of the early round (mostly 1st and 2nd) draft picks, at running back, drafted between 2009 and 2014. 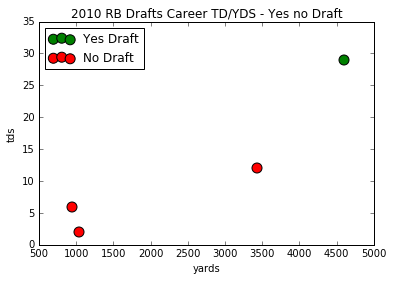 Our machine learning running back analysis system was applied to determine what picks were “yes draft” players and which were “no draft” players based only on college stats. The players are rated yes or no if they would have been drafted and the probability the system thinks they fit in that category. In testing, our system was 86% accurate in finding productive NFL running backs. *** THIS ANALYSIS IS BASED SOLEY ON COLLEGE STATISTICS OF THE PLAYERS BELOW. 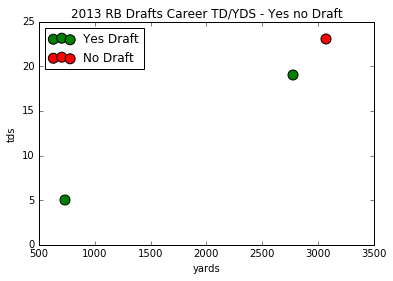 If you picked “yes draft” backs for 2009-2014, you would have had an 86% chance of selecting a productive back. 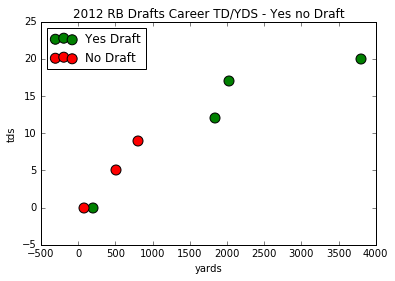 If you picked “no draft” backs for 2009 – 2014, you would have had a 41% chance of selecting a productive back. 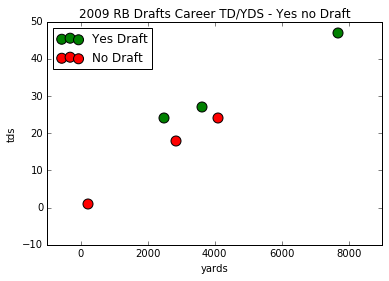 Below you can visual where the draft and no draft players stand relative to each other by year and “yes draft” – “no draft”. 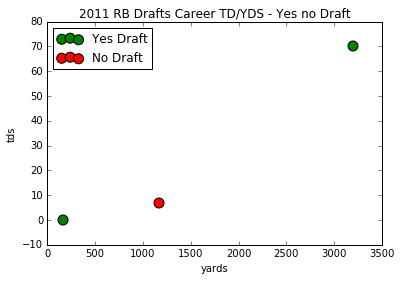 If you picked “yes draft” backs for 2009-2014, you would have had a 86% chance of selecting a productive back. 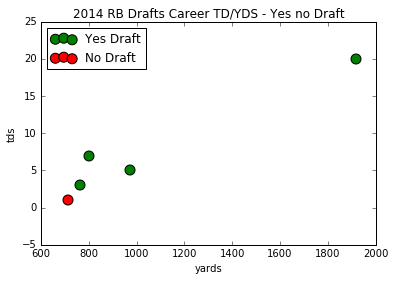 We will soon release our analysis of the 2016 running backs that were drafted. Can machine learning make sense of the NFL’s big data?